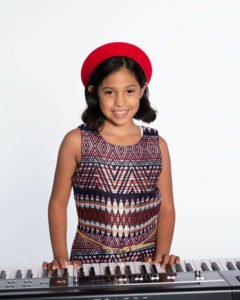 Looking for a piano teacher who is fun & patient ? Piano lessons are a great way to begin learning about music. Our piano instructors teach a wide range of styles from classical to classic rock, blues and pop. 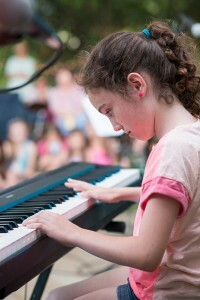 Our goal is to help you become the pianist that you have always wanted to be. You do not have to have a piano at home to start lessons. An electronic keyboard of reasonable quality will be sufficient for the first 6 months to a year. More importantly, our piano teachers are warm, friendly and ready to work with you making piano lessons a fun and positive challenge for students. Creating music on a keyboard or piano in relatively easy. Therefor, you can experience success rather quickly with a little practice time and great piano lessons. Students gain confidence if they are persistent with lessons and short periods of practice throughout the week. Early beginners may spend only 10 minutes at a time while they are getting acquainted. Within our piano lesson plan, students are encouraged to bring up their own ideas for songs to learn. Students will work on classical and contemporary music that is probably new to them. We foster the development of appreciation for composers like Bach or Mozart or bands like Coldplay and Queen; The Beatles and Tom Petty. A love for music lasts a lifetime. The confidence, focus and process of learning will stay with you for years to come. We are honored and proud to provide superior piano lessons to students from Cedar Park, Leander, Liberty Hill, Round Rock, Georgetown, and Austin TX. Focused at One of our recitals. Our piano teachers work with students on the fundamentals of music including understanding notation, scales, chords, reading and rhythm. As the piano lessons progress, the teacher will typically engage with the student in playing the parts of the song or exercise together. The students will work with a method book and learn real songs that they can play for their family and friends. Learning to play piano is well worth the effort. Piano, like any other instrument, is not easy. If a piano student is persistent with lessons, their progress will improve at a faster pace. It’s important that you don’t give up. It takes time, patience and persistence. The ultimate hope for us is that we provide an experience that instills a passion and sensitivity for music. The power of music to impact our lives is a human gift that we are passionate about cultivating. Some of us had the experience of taking music lessons as kids. We were asked to, and sometimes forced into, practicing scales and the Hanon exercises, with the motivation that “it builds character.” If that was a phrase that you had heard from your folks as a child practicing music, your parents were right. In a study conducted by The University of Vermont, scientist provide evidence that a high quality MUSIC education for our children may be one of the most effective ways to ensure success in their lives today and in the future. Let’s face it, there is a lot of complicated aspects to life. We can give our kids a better chance to cope with the emotions of every day life through positive activities like music lessons. That’s why we love giving piano lessons! The UVM Medical Study was conducted by James Hudziak and his colleagues. The team analyzed brain scans of over 200 children from ages 6 to 18 years. The objective was to find a connection between the brains cortical thickness and musical training. Past studies showed that changes in cortical thickness were corresponding to anxiety, depression, attention problems and aggression. In an interview with the Washington Post, Hudziak said “what we found was the more a child trained on an instrument, it accelerated cortical organization in attention skill, anxiety management and emotional control.” Not only that, the team believes that music training is a powerful treatment for cognitive deficits like ADHD. A brief history of the piano: For about 300 to 400 years the harpsichord was used much like a piano except that the strings were plucked. In the 1700’s, an Italian inventor came up with the idea of striking the strings with a hammer therefor giving players the means to play softly. His name was Cristofori di Francesco.